It's beginning to look a lot like Christmas! Especially around Casa Ten June. The tree is up and decorated (but more on that Thursday when we link up with Megan! ), the wreaths are on the front windows of the house (shhh, but I haven't had the heart to tell hubs he hung them with the bows all lopsided... a crooked Christmas anyone?!) and our mantel is officially ready for Santa to come on down the chimney. 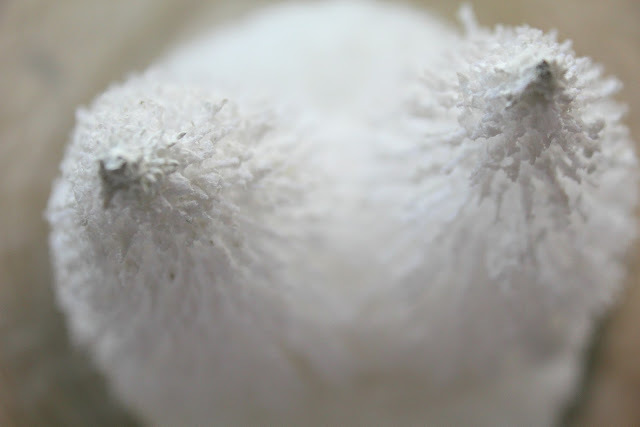 Let's take a closer look, shall we?! 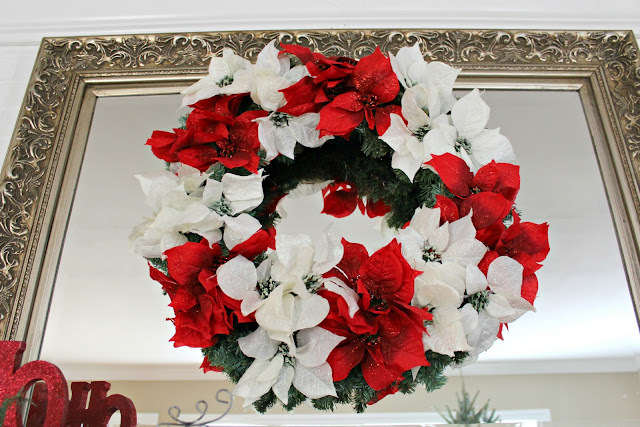 I'm kind of in love with the white + red poinsettia wreath I hung over the mirror. I simply used an extra faux evergreen wreath that I had laying around and stuck in (literally- no fancy gluing here) some clipped pieces of sparkly poinsettias. Our Pottery Barn stockings and Target reindeer stocking holders made their way back from last year's mantel (which, by the way, isn't it funny how vastly I have improved my photography skills since last year's mantel picture taking?! Cra-zay). I also lined the top of the mantel with fresh evergreen tree trimmings and some holly berry clippings from the front yard. Fresh pine smells goooood! 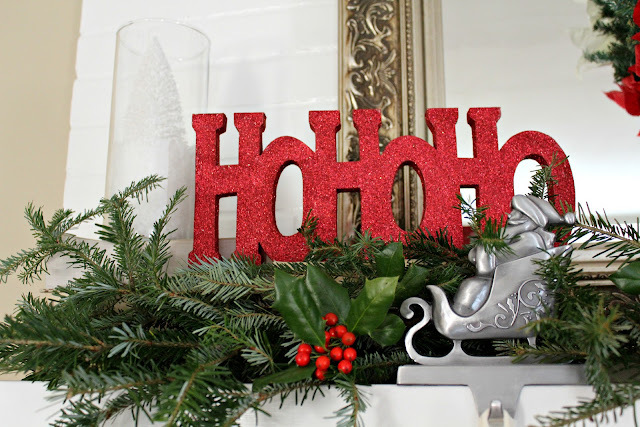 I picked up the sparkly "Ho Ho Ho" sign at Target last year for $1! Love it. And did you notice a few little white snow globes on either end of the mantel? They were kind of hard to snap a picture of against my new glossy white mantel (woot woot! looks so much prettier than last year's off-white color! 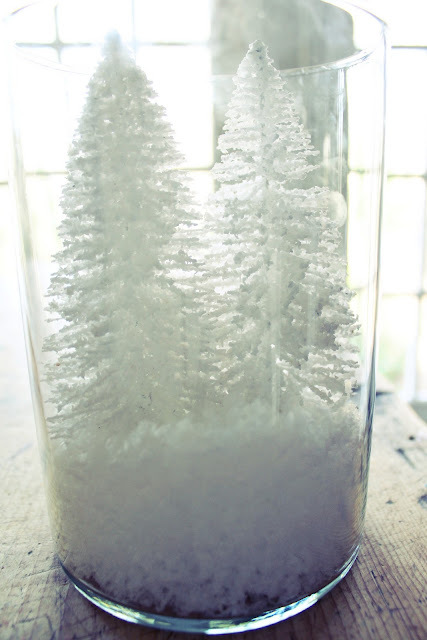 ), but they're simply hurricane vases with fake snow and white Christmas trees. So pretty! Oh and did you notice my adorable Pottery Barn reindeer up there? For some reason or another, my sister has kind of fallen in love with him and affectionately calls him Chris. He's quite the member of the family now. Maybe Chris needs a stocking next year? So there you have it! Our Christmas mantel for the season. Now it's high time you shared your mantel with me! Come on, don't be shy! 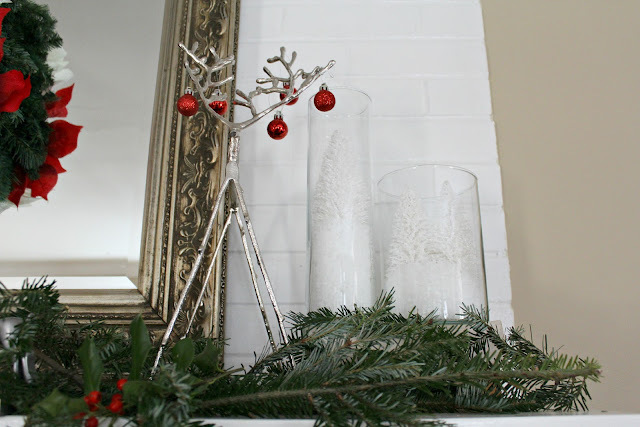 Link up your holiday mantel or, if you don't have a fireplace mantel , your fantle... that's faux mantel for those of you who aren't familiar with the fake words I make up. Be it a tabletop or shelf, bookcase ledge or sideboard, a faux mantel can be just as gorgeous as a real one. 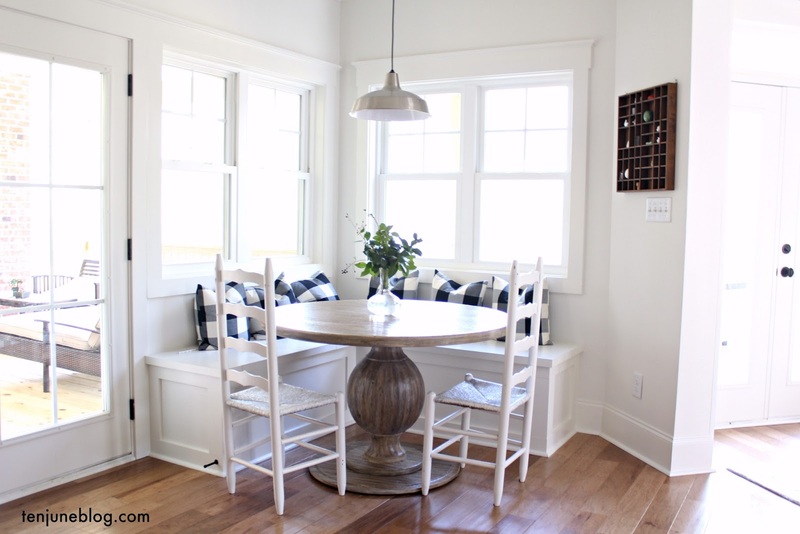 I'm also linking up my mantel over at Southern Hospitality, A La Mode, Centsational Girl, Bower Power, Under the Table and Dreaming and My Uncommon Slice of Suburbia! Your mantle is beautiful Michelle!! Love the red and white color scheme. How pretty. The white and red theme is just perfect. Looks great Michelle! I love the reindeer.. I have one similar and he's stolen my heart too! I also love the bottle brush trees. They are my favorite for adding a vintage touch! I'll be back to share mine on the weekend. 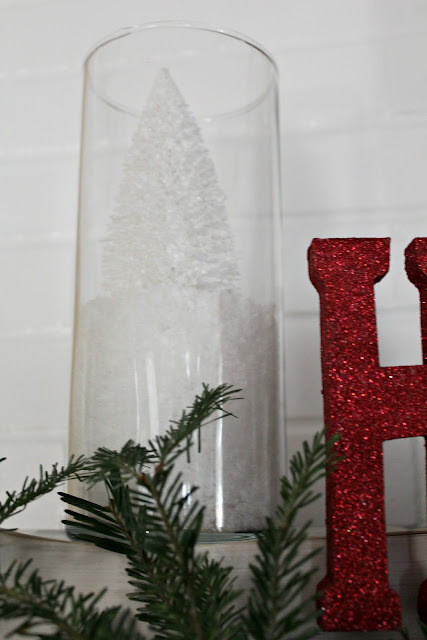 I use fresh greenery and I don't want it to be dried out by Christmas if I start too soon! 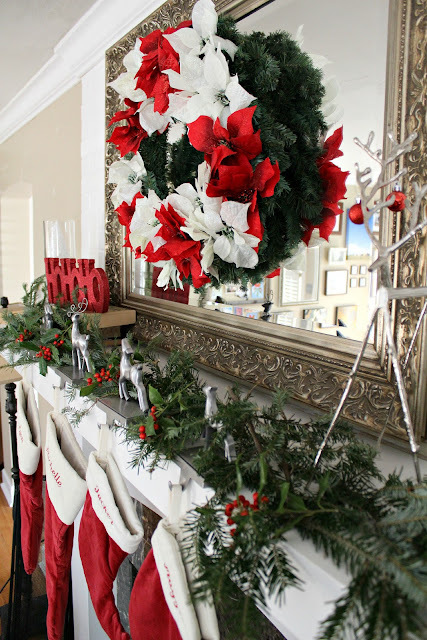 Love your 'Merry & Bright' mantel!! Your trees in the hurricane are so pretty! Thanks for hosting the party! Thank you so much for hosting. This is a fun series which got me working on my mantle sooner. I am a new follower. Cute mantel and thanks for hosting. I have a little crush on Chris too. Your mantel looks beautiful. Thanks for hosting the partay. Beautiful mantle! Chris is killing me. He is SO happy and festive with the ornaments on his antlers. Thanks for hosting! I love the red and white Michelle- so festive!! Your mantel is gorgeous! I love all the red and Chris is cute too! Thanks for hosting. 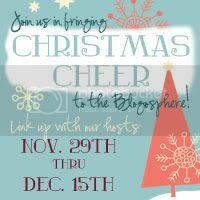 I think I am going to spend most of my free time blog hopping today! Sooooo pretty. I especially love the stripes on the wreath!! Thanks for another great party. Love the colors! Those hurricanes are so so pretty! Wow I love comparing last years to this years and how your style has changed and evolved. We have the same pottery barn deer and I love him! Love your mantel! I love red, and white...and I have to throw in all the other colors too! so beautiful! love the red and white- and those white bottle brush trees! thanks for hosting! Love that you did this! Can't wait to look at all the mantles! :) Yours is lovely by the way. hi, thanks for hosting this lovey party! Can't wait to see all the other mantels. Yours is beautiful, of course! love this mantle! It's so classic and beautiful. Love the traditional red, white & green! 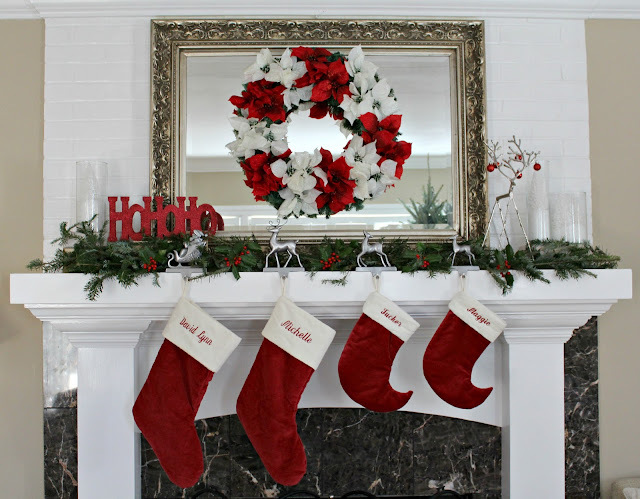 I have those same Pottery Barn stockings and love them! Thanks for hosting girl friend. Yours looks amazing...but I already knew that from my preview (: That reindeer is darling!! Michelle, your mantle looks beautiful!! Really it could be in a magazine. And yes, your photography is ah-mazing now!! I have a lot of practicing to do still on my camera to catch up to you. Happy Holidays!!! So pretty!! Love the snow globe and the silver reindeer with ornaments on his antlers! Great party -- everyone loves mantels!!! Great mantel, those trees in the vases are darling! Thanks for hosting, there are so many great ideas! your mantle is beautiful....thanks for hosting the party for us! Such a classic & beautiful mantle! I'm dreaming of the day when we have a mantle to decorate. Beautiful! I love your mantel! I had to laugh when I saw 'Chris' as I have his (almost) twin on my mantel! Off to link to the party. Thanks for hosting! Oh, he is cute ! Thanks for hosting. What a beautiful mantel! I just linked up! Thanks for hosting this wonderful party! Wow!! How beautiful is your mantel!! 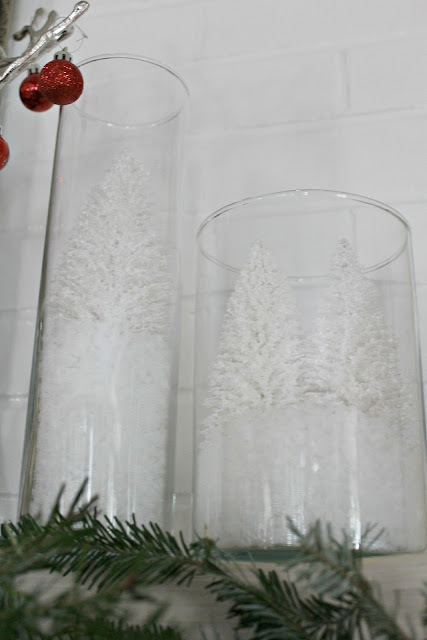 Love the little trees in the vases!! Beautiful red and white! Thanks for hosting a great party. Happy Holidays! 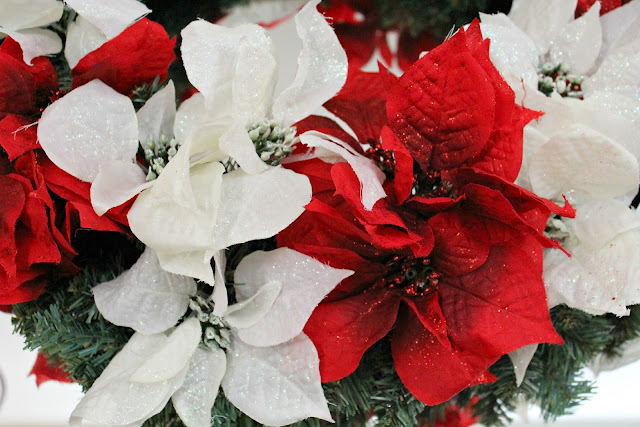 I love love LOVE the red and white poinsettia wreath! and the snow white trees in the hurricanes are so genius. Your mantle is beautiful! It's absolutely lovely! I love the little white trees in the glass. Beautiful! Thanks for hosting the link-up! I had a lot of fun with this one! so pretty! love that little reindeer! Great looking mantel! That Chris sure is a cutie! Thanks for hosting. Love the white trees in the hurricanes and layering the wreath onto the mirror! Linking for first time with my Bling Burlap Bedspring and a Bit of Leopard Mantel. Thanks for hosting. Forgot to mention now a happy follower! Very pretty Michelle! I especially love your little snow globes and that reindeer...oh, he's too cute! Thanks for hosting a great party! Thank you for hosting! 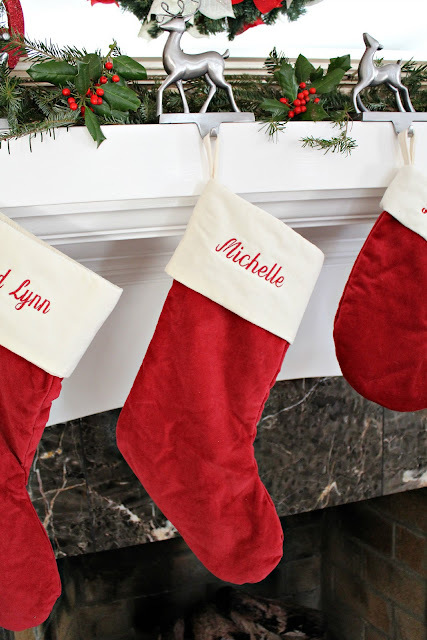 We have the exact same stockings- complete with two big ones and two little ones! Can't go wrong with classic red and white stockings, right? Funny that we both used red and white with natural greens and yet they look so different. Endless variations on a theme. Beatiful mantel! So bright and cheery! Thanks for hosting! Beautiful. I love how the red pops against the white backdrop. I'm your newest follower. Would love for you to stop by and visit. Thanks for hosting this party! I'm so excited to join your mantel party and want to thank you for hosting! Your mantel is just gorgeous and your photos are amazing too! I'm late to the party but at least I made it! :) Love your mantel too!! I'm linked up and excited to participate in your party!!! I'm your newest follower and would LOVE to have you visit and return the "LOVE!" Your mantel is so sweet!!! Just linking mine ... better late than never! Beautiful mantel. 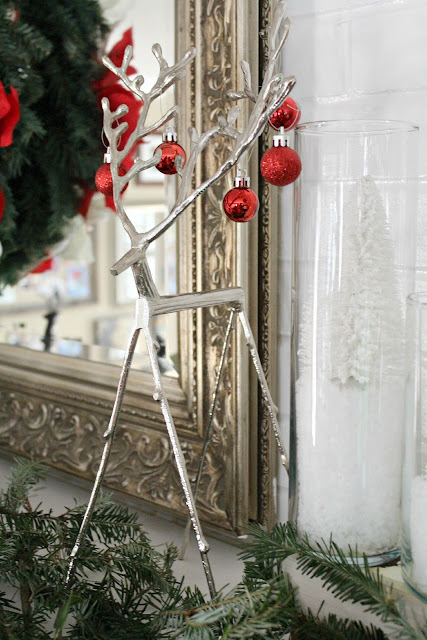 I love that little silver reindeer with the red Christmas balls hanging on his antlers. He makes me smile. that mantle looks incredible RB!!! Just found your blog and I've linked up my White, silver and chartreuse mantel to your mantel link up party! Have a great weekend! Joining in the mantle link party a little late (but better late than never right?!) I love your mantle- looks so great!!! 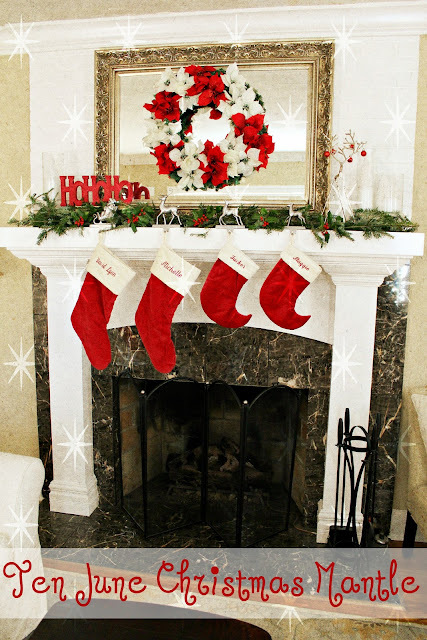 Your mantle looks so fresh and festive! Everything looks so pretty! I love red and white for Chrsitmas. Also, really digging the little white bottlebrush trees. I love seeing all the different mantles! Beautiful. You have the most beautiful Christmas decorations.